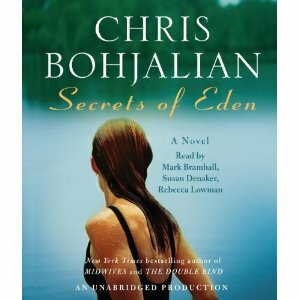 Murder and suicide in a psychological thriller and whodunit – The Secrets of Eden is the newest Chris Bohjalian page-turner. Like most murder mysteries, the action is completed in the first chapter – but what really happened and who-did-it is the story. Alice Hayward, beautiful and abused wife of a successful local entrepreneur and lover of the local pastor, who baptizes her with others in an outdoor ceremony – is killed that night. Did her husband kill her and then himself in a drunken rage? Bohjalian takes you into the heads of each of the key players: Reverend Stephen Drew, going through a crisis of faith; Katie, the surviving daughter; Heather Laurent, best-selling author of books on angels, whose parents also died in a murder-suicide; and Catherine, young mother and state’s attorney investigating the case. The interactions are complicated by each of the character’s inner doubts and longings, and, even with the romance of the writer and pastor, gets a little tedious. But the investigation will get your attention and take you into the realm of a CSI drama – not for the queasy. Bohjalian’s talent is in the telling – his endings are lacking. Like his Double Bind, the final chapter here will leave you a little angry that he couldn’t come up with something better. The finale is predictable, but the story is compelling enough that you will read it all anyway. This entry was posted in mysteries, reading and tagged Bohjalian, mystery, psychological thriller. Bookmark the permalink.